Spinal dysraphism, as coined by Bremer in 1926 and reintroduced by Lichtenstein during the 1940s, refers to defective fusion of the neural tube in the dorsal midline during embryonic development. The manifestations thereof are varied, from an overt spina bifida as seen externally along the spine such as spina bifida cystica, to a hidden one covered with a layer of skin and therefore called occulta. As time passed, cases emerged that further enhanced the medical community’s insights into the embryology and pathology of dysraphic states, leading to a more comprehensive understanding of the urinary, cutaneous, orthopedic, and skeletal abnormalities associated with spinal dysraphism and particularly occult spinal dysraphism. The result of these advances led to the development of clinically based methodologies for the management of spinal dysraphisms, as pioneered by Ingraham and, later, James and Lassman. 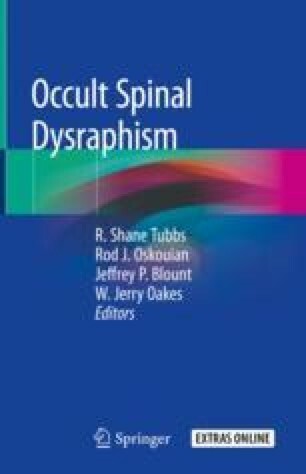 Herein, we review the interesting history of our descriptions and understandings of occult spinal dysraphism.